Enforcing a Lean transformation does not work. Instead, you should show the benefits! This is the conviction of Bart Evers, production manager and Lean deployment leader at Philips Lighting in the Netherlands. ‘Seeing is believing, and believing is copying’, he says. Evers tells how his team leaders started to connect their production steps smoothly to one another, all by themselves, after he had given them the experience of close coöperation. Next, Evers demonstrated the importance of standardization, by showing how Leader Standard Work makes his own work more effective. Nearly his complete, openly visible, agenda now consists of timeslots. Not cycle times yet, but it comes close. In addition, Evers records strictly when he adds value for the company. Being a manager, useful activities are coaching, support and the improvement of processes. Thanks to the Lean transformation, Philips Winterswijk can assemble lighting fixtures make-to-order via a 'normal' Lean production line. When a product only changes a little bit, the assemblers can read and understand the new work instructions within one cycle time. The delivery reliability, formerly one of the biggest problems, increased enormously. When an order is delivered late, this is rarely due to the production anymore. But the most important result are the satisfied customers! The factory of Philips Lighting, in the city of Winterswijk in the Netherlands, makes LED lighting fixtures. These are elegant and tailored light boxes, usually to be mounted in ceilings, for example for the illumination of offices. In the framework of Lean manufacturing, you want to create a continuous flow of semi-finished products across the shop floor, from raw materials to finished products. This results in little intermediate stock, a short throughput time, and a high delivery reliability. Each assembly line can produce a certain group of products. When a product changeover takes place, the assemblers switch to new work instructions in a standardized way. Note however, that this is customer-specific production. So, at least a part of the changed work instructions is completely new! The time needed to read and understand those instructions almost completely determines the changeover time. When a product is (almost) entirely new, reading the instructions and gradually starting up until the normal production rate is reached, takes about two hours. However, sometimes the work instructions only change a little bit. In that case experienced assemblers need only one minute (one takt), for a changeover. The next takt they continue their work like nothing was changed, be it that they assemble a slightly different product. In my experience, such a Lean assembly-to-order line is unique. 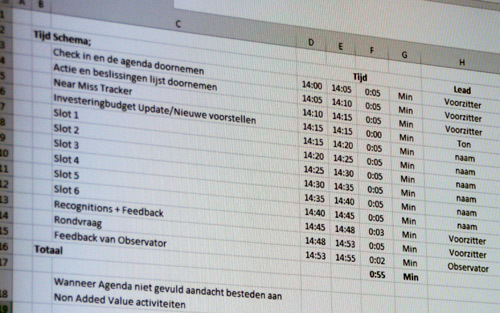 More about how Philips Winterswijk accomplished this later! The order of the lighting fixtures to assemble, the assembly schedule, determines the planning of all other production activities in the plant. The production of parts must start (much) earlier, to make it possible that these timely arrive at the assembly line. A logistic worker rides the parts on trolleys to the assembly line. Materials for the product that is currently assembled should always be available, as well as parts for the subsequent product. The LED boards are purchased. The production of the parts for the housings starts with sheets of steel, with a thickness of 0.6 or 0.8 mm. The production of those parts roughly encompasses the steps: laser cutting or punching, bending, spot welding and powder coating. All those steps are not always needed. To finish each step, one day is reserved. Therefore the throughput time in the whole factory, from sheets of steel to finished lighting products, is several days. Next, Evers selected one performance indicator to initiate a Lean transformation. This was the delivery reliability. Then, by taking small steps and by applying daily management, he started to motivate the team leaders to do things differently themselves. These actions increased the delivery reliability already a bit. However, a side effect was much more important. The team leaders had to work together, to solve the quality problems quickly. That created a bond. In addition, they started to understand the relationship between their production activities and the steps before and after them in the production chain. To stress the importance of standardization, Evans took the same approach as when he wanted to make the production planning Lean. He demonstrated the benefits, hoping that others would follow. Lots of things Evers does as a manager are repetitive. These things can be standardized, and after that continuously improved. In Lean terminology, this is called leader standard work. Evers' agenda now resembles the time slots at an airport. Even the comparison with cycle times forced itself upon me! In addition, Evers records which things he does add value or not, to identify improvement opportunities. 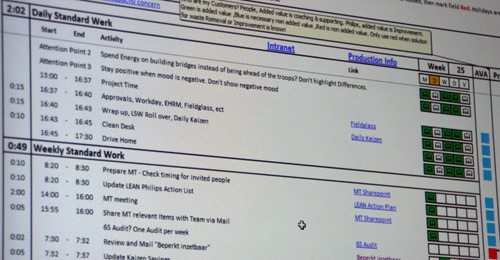 And perhaps most important: his agenda is visible on the intranet for everyone, including personal improvement goals such as "building bridges instead of focusing on differences." A manager has customers: the operators, the assemblers and the team leaders. A manager can create value for those customers by coaching and supporting them, by giving direction, or by contributing to process improvement. Everything else a manager does is in Lean terminology waste! The far-reaching application of leader standard work within Philips Lighting Winterswijk, was noticed during Lean audits by Philips. Managers from other Philips Lighting sites now visit the factory in Winterswijk to learn from this. Philips Lighting is being split off from Philips. However, also managers from Philips still visit Winterswijk, because this production site is seen as a benchmark for leader standard work. Besides the introduction of standard work, there is another thing important when you want to become Lean. You have to dare to experiment, and be allowed to make mistakes. A prototype is built and tested by the R&D department. Often, this prototype is sent to the customer. When this customer decides to place an order, the product is further engineered until it is production ready. From the CAD system, an assembly sequence is developed. Corresponding work instructions are made and printed. These work instructions are sent to the Lean assembly line. 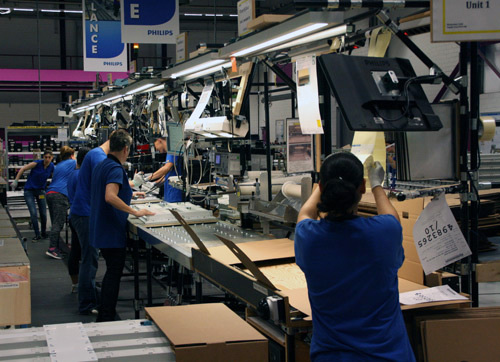 When products are assembled more often, the assembly line is gradually fine-tuned. At this assembly line it is possible to work on two sides, to built relatively large lighting fixtures. Standardization, and the corresponding work instructions, is a prerequisite to built new products first time right on an assembly line with takt times. Processing steps are then connected to each other, with flow as a result. Another important aspect of Lean is to continuously increase this flow, and thereby reducing the throughput time, by improving the standardized production steps. 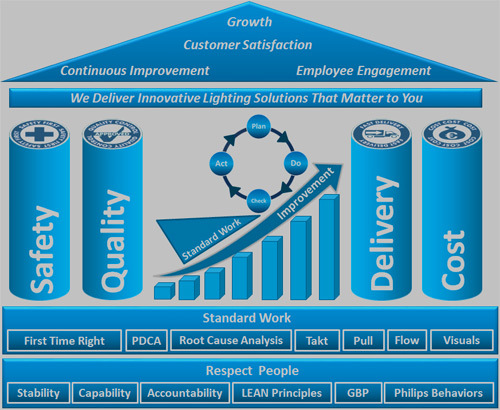 Standard Work and Respect for people are the basis of Lean within Philips Lighting. Note the word growth in the top of their "Lean house". Growth makes it possible to combine efficiency improvement with the preservation of jobs. The key question at the end of this article is: what is the yield of this Lean transformation? 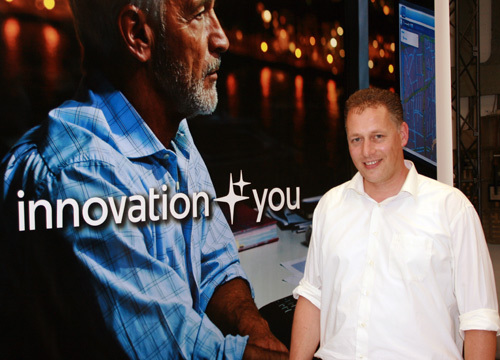 Did it raise the productivity of Philips Lighting in Winterswijk?